The Blind Side is a squeaky clean American family sports drama, based on the true story of the Baltimore Ravens’ current offensive tackle Michael Oher. But he’s not the main character. The star of the show is Sandra Bullock, who plays southern-fried Memphis decorator-turned-saint Leigh Anne Tuohy, Oher’s sassy savior who takes the boy in off the street, makes him a member of her family, supports his education, and assures his future in football. This is the kind of “inspirational” movie that Hollywood breaks out their most syrupy score for, using it to accompany all of those forced feel-good moments. At almost every turn the result remains moving, though the audience can see right through to the mechanisms pulling their heartstrings. Oher, as portrayed by Quinton Aaron, is a near-mute gentle giant, towering over the other kids in the Christian school where he’s been enrolled. He’s almost completely deficient of a personality here, communicating through short expressions of confusion or sadness or happiness. Hinting at Oher’s troubled past, we catch memory flashes in his mind, but the movie never really delves into what might’ve been an interesting history. Leigh Anne and her blandly accommodating husband, Sean (Tim McGraw), spot Oher walking home in the rain. Recognizing him as a classmate of their children—the animated son S.J. (Jae Head) and the bright daughter Collins (Lily Collins)—they realize he has no real home and offer him a warm place to stay. Eventually the Tuohy’s buy Oher has his own car and private tutor (Kathy Bates), so he’s living the high life on the nice side of town for a change. There’s only a brief scene or two dedicated to the projects where he came from, and perhaps it’s because the movie doesn’t explore those roots in detail that Oher remains a lacking character in his own story. 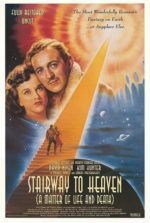 Instead, the movie seems to be more about the potential glory of rich, Christian, pointedly Republican white people acting as the saving grace to impoverished African Americans with sports potential—at least, more than the bravery of a troubled youth escaping his environment to better himself. After receiving raised eyebrows from her snooty friends over her decision to adopt the boy, Leigh Ann gives a number of stirring speeches about how she doesn’t care what anyone else thinks. “You’re changing that boy’s life,” one of her fellow socialites observes. “No,” she replies, followed by a swell of hammy music, “he’s changing mine.” But did Oher change Leigh Anne’s life? She started out a caring well-to-do with a penchant for charity cases and ended up just the same. It’s not as though she was a selfish person before Oher, and then learned throughout the course of the movie to become generous. Where was her growth as a human being? There was none, whereas Oher’s development was only explored from a safe distance. Bullock has been mentioned as an Oscar shoo-in for her performance, but her presentation feels carbon copied from Julia Roberts’ gumption-fuelled turn in Erin Brockovich. There’s even a suspiciously familiar scene where Bullock, cleavage exposed, puts someone behind a counter in their place with her straight-talkin’ verve. It’s pretty amazing when she’s able to quiet a gangbanger from Oher’s past with her snappy southern tongue, when in reality the drug-dealing hood would’ve probably gunned her down. This is very obviously one of those roles that an actor seeks out, hoping to be nominated for an Oscar. And while it’s some of the best acting in Bullock’s usually fluffy career, there were more worthy performances this year. 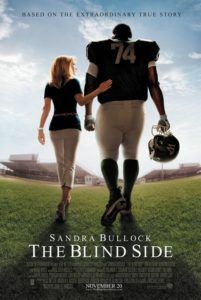 Based on Michael Lewis’ book of the same name, The Blind Side was written and directed by all-American filmmaker John Lee Hancock, the man behind such cushy stories as 2004’s The Alamo and the baseball picture The Rookie. Given that the movie is in theaters at the same time as Lee Daniels’ similarly-themed, but considerably more realistic and affecting film Precious, Hancock’s movie feels like an overly schmaltzy Disney production. 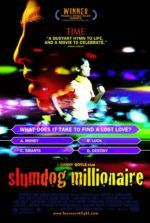 All the realism of the story has been replaced by heavy sentimentality and scenes that play to audience expectation. If you don’t mind feeling manipulated and being pandered to for the sake of some uplifting entertainment, then you’ll probably be among those in the audience cheering and crying at the precise moments you’re supposed to, enjoying every minute of it.